It`s that time of year again. The nights are long, the days short. It`s almost like you have less time in the day to do all the things that you used to get done easily in the summer. We dont`t have a tumble drier so things like drying clothes just takes FOREVER this time of year. It`s also the time of year where things seem to be harder mentally. As far as blogging goes, my motivation is non-existent. I have SO MUCH to say, but then I try to put pen to metaphorical paper and just sit there going `ummmmm’ for a while, which is essentially how you end up with drivel like this – haha. I`m going back to work in about two weeks, all being well. I was originally signed off for a month, but the doctor then authorised another two weeks so that I could set up some support from work in the shape of the occupational health department. To be honest, I`m relatively ok about leaving Eden as Amy`s sister will be looking after her and I know she adores her. I`m looking forward to hot coffee and adult conversation to a point, but I wish Iwasn`t returning to this job. I`ve applied for a few other things recently, but obviously I will still need to give notice at my current place if i get any of them, so going back is unavoidable. I don`t want to be signed off sick just for the sake of it, but it would be foolish to not admit that a lot of the anxiety is to do with returning to a toxic environment. I definitely didn`t go on maternity leave on the best terms and I get the feeling that not a lot has changed in that respect. But, as always, we will power through and see how it goes. It`s easy enough to go in, do my job and come home so that is what I`ll be doing. It keeps money coming in in the mean time, which is always needed! Eden continues to be a little superstar. I didn`t do a thirteen month update – maybe I should – but she`s amazing me with how much like a little person she is now. She`s not a baby any more. She`s got her own likes and dislikes, throws mini temper tantrums and can ask when she wants certain things. One of her favourite games to play is to put absolutely anything to her ear like it`s a phone. Anything from a toy phone to Amy`s wallet gets shouted into like she`s terribly busy and important. She adores Minnie and Mickey Mouse, Frozen and dancing to the songs that her toys play. 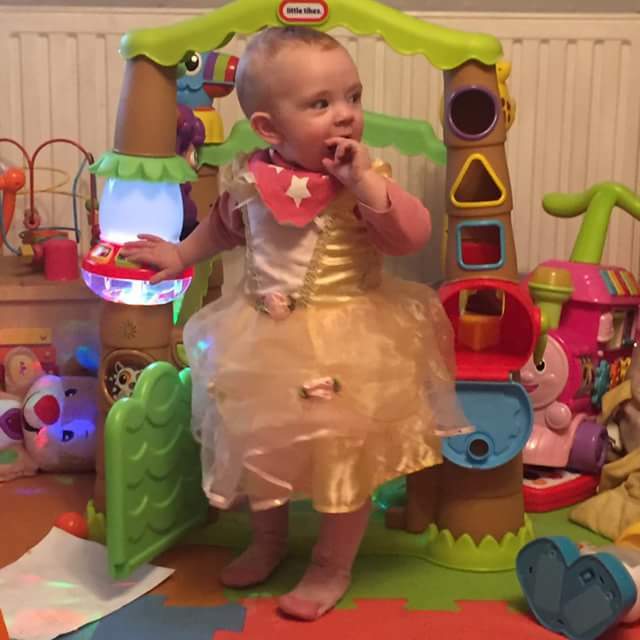 She has a princess car that she absolutely loves and will sit in for ages. Just yesterday, we got her a little Minnie Mouse tent and she spent the evening running in and out of it and taking her toys in there as well as the dog… Truth be told, she`s everything I hoped for and more.Anyway, stick with me. I`m writing as and when I can and hopefully will be posting a lot more in the next month. I just got a tablet through my phone provider in the hope that it will make bloggin gon the go a little bit easier. This post is brought to you from my local coffee shop, during nap time! I have lots of new reviews to come and an awesome competition too, so that`s something to look forward to! This entry was posted in 2017, Anxiety, baby Eden, depression, two mums, work and tagged depression, eden, lgbt, two mums, update, work after maternity leave, working mum. Bookmark the permalink.